Molly Miller, owner and full-time baker of Sift Gluten Free Bakery. Contact Molly with any wholesale questions or special orders. Platforms like City Food Studio empower our community to make a living out of doing what they love with little risk or initial investment beyond a belly full of creative thinking. We set off for our second visit to the shared commercial cooking space to spend a Sunday with owner and full time baker Molly Miller of Sift Gluten Free Bakery. Who also happens to be a one hundred percent delightful human being. Molly has been baking treats using her own unique blend of gluten free flours that you won’t find anyplace else. It’s this unique blend that make her baked goods a serious competitor for the conventional; whether you are gluten free or not, they really are supreme. Molly turned out the most amazing tasting cinnamon+nutmeg donuts while sharing her story and giving us a little lesson on just what gluten really is. If you haven’t already tasted Sift’s baked goods at one of over a dozen Minneapolis locations you can special order GF treats or visit her at the Kingfield and Fulton Farmer’s Market this summer. From top to bottom: Pear + ginger, pistachio + chai, blueberry and lemon-poppyseed muffins. Champagne cupcakes. Cinnamon-spice donuts with a vanilla bean with maple glaze. Tell us about your operation - What do you do? How long has the business been in existence and on what kind of scale? Has the business changed scale since its initial inception? Sift Gluten Free started at the Kingfield and Fulton farmers markets in 2013. The markets were looking to provide a gluten-free option to their customers, and I wanted to see if baking on a larger scale was something I could actually do! Muffins, scones, donuts, cookies, brownies…a little bit of everything is usually available at the markets. At the end of that season, I started working with Peace Coffee to provide gluten-free items at their Wonderland Park location. Eighteen months and countless muffins later, Sift items are now available at thirteen coffee shops. When I started Sift, I had envisioned a quaint little storefront—not a wholesale business. I still dream of the storefront, but wholesale has been a great way to quickly provide people with gluten-free options. It’s also been a great way for me to experiment with recipes and learn the business side of baking. What is your background and how did you decide to start baking commercially? I was diagnosed with Crohn’s disease at 13, and had become frustrated with my doctors’ lack of advice on what to eat and how to take care of myself. It seemed a digestive disease could—and should—be managed through what I eat. So, in 2007 I enrolled at the Institute for Integrative Nutrition. My time at IIN eventually led me to experimenting with a gluten-free diet, which then led me to experimenting with gluten-free baking because I wasn’t about to give up sweets! Since college I’ve had various jobs in book publishing, marketing and advertising as an editor and writer. Baking was always just a relaxing hobby for me. I’d often talk about opening up my own bakery, but because I have no formal training as a baker, I just wrote it off as a dream. Over the last few years, though, I looked around Minneapolis at all the great food businesses that started as food trucks or at a farmers market, and I thought, “Why not give it a try?”. And I have to say, I’m really glad I did! What is gluten? Why would someone want to avoid it? Gluten is a protein found in wheat, barley and rye. People diagnosed with Celiac disease have an allergy to gluten, meaning they have a severe reaction if it’s ingested. There’s no messing around with gluten when you have Celiac disease. There’s a second group of people who are gluten free, and they have what is considered a sensitivity to gluten. This is the category I fall into. For me, avoiding gluten has helped control the symptoms of Crohn’s disease. I also feel significantly less bloated, more clear headed and more energetic from eating gluten free. Everyone’s reactions to gluten can differ, which is one of the reasons there’s no easy way to diagnose a gluten sensitivity. I know there are people who don’t believe gluten sensitivity is a “thing,” and it’s frustrating. If you pay attention to your body and know certain foods don’t make you feel your best, why wouldn’t you cut them out of your diet? Mixing up Sift's gluten free flour blend. What quality does gluten bring to foods? Think of a classic French baguette. Gluten provides pretty much everything that defines it: the crunchy outside layer; the soft, airy inside; the holes perfect for catching butter and jam. Gluten provides all of the texture, structure and flavor qualities that make bread bread—and help hold it all together in one tasty little package. It’s not impossible to recreate this effect without gluten, but because it takes more than simply substituting flours, baking without gluten takes a little experimenting. What are good substitutes and can you simply swap wheat flour with rice flour? Gluten-free flour substitutes require a balance of both starch and grains. I make my own mix with five different types of flour, and also sometimes bake with almond flour. There are many gluten-free flour mixes on the market that can be used as a one-for-one substitute for traditional flour, but most contain xanthan or guar gum, which I prefer to avoid. These gums act as binders and help to provide a texture similar to gluten. Some people with Celiac have issues with xanthan, though, so I decided just to bake without it from the start. I use flax seed and occasionally psyllium husk as a binder instead. Don’t let what I’m saying intimidate you, though! If you want to take a stab a gluten-free baking, pick up a pre-made flour mix and give it a whirl on a favorite recipe. You’ll probably be pretty happy with the results! Cinnamon sugaring the Cinnamon-spice donuts. What are your favorite sources for recipe inspiration and ingredients? I initially started by converting family recipes to be gluten free and often dairy free. Apple coffee cake, banana bread, cut-out cookies—nothing fancy, but definitely items I missed once going gluten free. Oftentimes I don’t remember what inspired certain recipes. I get a flavor idea, then stumble down a rabbit hole online, bookmarking recipes and making notes. Many times it’s gluten-full recipes that are the start, because I want to get the balance of flavors right and will use them as a guide. Bon Appetit and Cherry Bombe are two magazines I always have on hand. And Instagram is an endless source of inspiration. My mom always had cookies, bars or quick breads on the counter when we were growing up. Again, it was nothing overly fancy, but there was something about a homemade treat that I always loved. Her chocolate chip and M&M bars had a special following among my high school friends. It’s a simple yet thoughtful way my mom shows she cares, and I think that’s what baking is all about: sweets for those who make your life a little sweeter. Within a little over a year, Sift went from supplying one coffee shop to thirteen. There are still days when I find myself thinking, “What? How did this happen?” And then I just smile and get back to baking. In November 2014, I decided to make Sift my full-time job. It was (and still is) scary to leave the comfort of a traditional full-time job, but I wasn’t sure how to grow the business without giving it more time and energy. Limited edition Champagne cupcakes available for special order. Balancing baking with business is a lesson I’m always learning. I try to set boundaries around my time—for example, I’ll practice bake in the morning, then tackle bookwork in the afternoon. That is a tough task for me, because I’d just spend all day in the kitchen if I could. Alarms definitely need to be set to remind me to move on. In addition to continuing to grow the wholesale business, I hope to start looking for a potential space for a bakery! Stay tuned…. Photographs by Minneapolis-based photographer Lauren Carpenter. French Lake Farmer in Annandale Minnesota is a truly unique growing space with a story that will inspire. This family operated organic farm produces the most beautiful, tastiest heirloom tomatoes grown out of Minnesota soil, and employs vertical urban farming practices alongside no-till growing methods. Yes, they are an urban family farm in a rural community, swoon. The Waite House is one of six community centers that make up Pillsbury United Communities. Their main mission is to foster resilient and self-sufficient individuals, families and communities by supporting otherwise underestimated populations. This may sound good on paper, but it's even better in practice. Not only does Waite House provide after school programs, employment, legal and crisis nursery assistance, they also focus on health and wellness through their Culinary Arts Training Program, Community Cafe, Food Shelf and several growing spaces on-site. We met up with Martin Brown (aka Farmer Brown), Health Equity Organizer for Waite House to pick his brain about their expanding growing program which includes indoor all season micro-greens, for use in the food shelf and community kitchen, as well their outdoor gardens which are planted and maintained by staff and community members. Not only were we blown away by the scope of what Waite House is accomplishing with limited resources, we were also moved by Martins personal story which resonated close to home and provides proof that you can always be the change you wish to see in the world, if you're willing and able to see and be it. Stay up to date with future Waite House Happenings here and if you're feeling inspired to help out, consider donating your extra seed trays and covers for the mirco-greens workshops, garden tools or excess produce from your gardens. Now over to Martin for some much appreciated living wisdom. I've been working on farms and with food, in one way or another, since I was 12. The social piece and the political piece came later -- I was radicalized as a teenager by folks I knew who were involved with the "anti-globalization" movement, as we called it at the time. Now, we know that globalization has created a plethora of possibilities for social justice organizing across borders. Even as corporate wealth and control have increased, the infrastructure has been built for exposing injustice and working together in ways we could barely have imagined in the 90s. The kind of activism I was involved in at that time and into my 20s was not very nourishing. We were "anti" this and "anti" that and very angry about the state of the world, but we didn't always have a vision for what we wanted instead. Working with the earth has been a very helpful outlet for the deep frustration of witnessing so much harm to the environment and people. These days, I am driven in my work by an ecological understanding of the physical and social worlds around me. Everything is interconnected and, knowing this, I strive to optimize relationships -- between plants, people, institutions... This is the indigenous way and it can be difficult for me to access sometimes, because I was raised in a world of subjects and objects. But I believe in a deeper collective vision and my own vital connection to the earth and her many communities. I am sustained knowing that, every day, I am helping build something more healthy, more resilient, and more aligned with the natural world. How many people volunteer or work at Waite House? We have 30 employees and over 200 volunteers. What is the mission of Waite House and which populations do you primarily serve? Waite House is one of six community centers that comprise Pillsbury United Communities. Pillsbury's mission is to work with under-resourced populations across Minneapolis to foster the resilience and self-sufficiency of individuals, families, and the community as a whole. Waite House started as part of the Settlement House Movement, so there's always been a strong connection to immigrants. So, yes, a lot of our services are for them -- especially Latinos -- but we do serve the entire Phillips neighborhood. How does food play an important role here? Food is important in peoples' lives. At the most basic level, it provides the sustenance that allows us to continue living, and this has been the level at which Waite House and other social service organizations have engaged people for a long time. But food does so much more than this -- it provides a sense of connection, it facilitates sharing across cultures, it creates the pathway to sovereignty. These are the levels I think we want to start engaging people on. Where are your primary sources of food donation? We have a food shelf that offers food to the community four days per week and a free meals program that feeds over 200 people every day. Those programs have been primarily using the emergency food system – Second Harvest Heartland and the Food Group – and they also receive donations from a handful of local farms. Now, with the Urban Agriculture Program, they also receive food grown onsite on a weekly basis with the additional support of two PRI Apprentices in 2016. This is highly nutritious food grown where folks can see it, and it’s food that, in many cases, community members have chosen and planted themselves. That kind of connection is not very common for people using the emergency food system, and it gets at those deeper levels of meaning that food has. How many growing spaces are on this site and how were they established? We grow food indoors and outdoors at Waite House. Inside, we have microgreens growing in the foodshelf and the café space. Those, we started last winter. It was our first foray into growing in the actual Waite House space, which is owned by the Minneapolis Park Board. The Park Board has never given us permission to grow here, despite repeated requests. So the microgreens were, in part, an experiment to see what would happen if we pushed the envelope a little bit. Ten months later and it’s the new normal. Now, the Park Board is getting ready to implement an Urban Ag plan citywide, and we are a part of that conversation. Hopefully, we are serving as a model of how you can grow food by the community for the community on public land. Outside, we have three apple trees and eight veggie beds – again, it’s a guerrilla garden. Three of them are for the youth in the youth program. One of them we use to grow herbs for the kitchen. And the other four are for the foodshelf. We established the onsite garden after a fatal shooting on our block this past spring. We really wanted to create more presence and a feeling of safety and care on the street in response to the violence. So, as you can see, there’s also solar lights and a peace pole there; one of these days, we’ll put a little free library out there, too. We’ve been trying a lot of cool stuff this year – bokashi compost, lasagna gardening, mushroom growing… But I think what I’m most proud of is that the kids in the youth program like the microgreens! If I walk down the hall with a tray of them, they crowd around me like I’m an ice cream truck. What unique challenges come with growing in the city? I’ve done most of my farming in rural areas, so for me, the number one challenge is SPACE! I like trees and animals and ecosystems in general; I hope we’ll be able to incorporate more of that into our growing systems as time goes on. That said, we work with social ecologies in the city. What we lack in growing space, we make up for in people power. And, to shift the frame, the Phillips neighborhood is roughly 1,000 acres. It’s more diverse in plant, animal, and human life than most 1,000 acre farms are. And, if this community can get gardens growing on 2% of that land, they’ll be producing more food and providing more habitat than any farm I’ve ever worked on. To make that level of change possible, we have to work at the policy level. Land access is the main area of policy the Urban Agriculture Program works with. I have a long list of families that want to garden but don’t have the space where they live, or don’t trust the soil where they live. We have a community garden about half a mile away, the Infinity Garden, which serves twelve families right now. The Infinity Garden is located on land that the City owns, which we lease for $1 a year. We’re trying to leverage that connection to get them to open more public land for gardens in the neighborhood, and we have some great partners in that effort. What kind of resources could the community bring in to help foster this work? We are hoping to open a second community garden in 2016, so we do have a lot of needs related to that. On the supplies end, we need clean soil, clean compost, raised beds, garden tools, a shed, a truck… But, like I said, people power is key, and once we have those things, we’re gonna need some folks to throw down and turn them into a garden. We are working on a sales program for our microgreens right now, so I’m optimistic that that program is going to be self-sufficient in terms of supplies come winter. We can always use more volunteers for planting and harvesting – and folks come out of those workshops with the knowledge of how to grow and a nice bag of greens for themselves to boot. There’s probably a thousand other ways we can plug folks in, too. GIS genius? We’ve got plans for you! Growing guru? Yeah, we need you to teach class on Wednesday night. Guerrilla gardener? Ha ha ha. Let’s talk about blanketing the ‘hood with wood chips and compost. What has most surprised you about this work? I had a big epiphany five years ago when I first started learning about permaculture. I had been a pretty serious environmentalist for a while then… I was biking everywhere, living in a crammed collective house, working at a food co-op, eating freegan… but I still believed that I was a “bad” organism. I was defining myself by my carbon footprint, and in that analysis, the best thing you can do is to throw yourself off of a bridge. And, living with that belief, I wasn’t very happy. Learning about permaculture changed that for me. I came to understand that I am a beneficial organism on the planet: all of my natural behaviors benefit the environment. We, as humans, can act as stewards of the earth and her ecosystems. When you look at it a little deeper, we are actually inseparable from them, one with them. After that, I thought my head had popped and my paradigm had shifted, and it was a done deal. But, through my work with Waite House, I learned that I was wrong. I am not only in relationship with the environment. I am also in relationship with the earth’s people! I feel like the last year has been a crash course in how to be a beneficial social organism. I’ve always been “nice” to other people – but that isn’t what I’m talking about. We live in systems that are every bit as damaging to us as the industrial food system is to the environment. We live in systems that commit genocide daily on the basis of race, class, gender, orientation… So, for me, being a beneficial social organism is about challenging those systems and building the new ones that will take their place over time. I was surprised to find that I am still living with a lot of “anti” sentiment in the social realm; maybe it took finding something sustaining to help me push through it. What qualities does it take to be a farmer? It really comes down to the people, I think. I’ve had so many inspiring teachers over the last few years… Paula, Lindsay, and Sam at Permaculture Research Institute Cold Climate, Starhawk, Pandora, and Charles at Earth Activist Training, Nat at the Draw Permaculture Sanctuary, Ben and Erin at Open Hands Farm. More recently: LaDonna Redmond, Louis Alemayehu, Nance Klehm, Christina Elias, Ernie Whiteman… I have been so blessed to study with and work alongside such amazing folks. Closer to home, my housemates, Les and Els, and my partner, Sara, are sources of strength and energy for me. These three are people who do incredible work with incredible hearts every day; the world is a better place for their being here. The Tiny Diner Farm is situated in the Longfellow neighborhood in South Minneapolis, rich with it's own unique farming history. This farm produces for Kim Bartmann's latest restaurant, the Tiny Diner. More than just a production site, this urban double lot serves as a Permaculture workshop and community education space. We toured the farm and sat down with the Urban Farm Manager and Community Outreach Coordinator, Koby Jeschkeit-Hagen. If there is one thing that many of the Twin Cities’ top restaurants have in common, it is serving up seasonal plates that celebrate the beauty and simplicity of ingredients being carefully and responsibly grown nearby. The name you hear again and again when talking to restaurants and chefs about their wonderful produce is Loon Organics. While touring the family operated farm last fall I couldn't help notice this same simplicity and beauty in the hands of farmers Laura and Adam's son Eli as he chowed down on a freshly picked carrot. Un-peeled and a little dirty, but packed with rich organic flavor. Loon Organics is a 40-acre certified organic farm located 60 minutes west of Minneapolis, MN, co-owned and operated by Laura Frerichs and Adam Cullip and their 4-year old son, Eli. Their mission is to nourish mind body and soul, and they have been doing so successfully for the past 12 years. Beginning at the Gardens of Eagan Incubator Farm in 2005, they purchased farmland in 2008 and have established a passionate and devoted 200-member CSA over the past 10 years. Loon has around 7-8 acres of certified organic vegetable production that provides for the CSA, local retailers, farm-to-table restaurants, and the Mill City Farmers Market in Minneapolis. 2016 CSA shares are still available now, but if you don't have a chance to sign up you can buy their amazing produce each weekend this summer at their booth at the Mill City Farmers Market in downtown Minneapolis. Owners and operators Laura Frerichs and Adam Cullip. In 2003, I was a year out of college with a Cultural Anthropology degree, working several office jobs and volunteering with a start-up public health non-profit in Minneapolis. I had been exposed to a burgeoning CSA and local foods movement around Grinnell, IA where I went to school and was curious about the basic act of growing food, gardening, and sustainable agriculture. I was lucky to get a job at Gardens of Eagan that Spring of 2003 and get my hands dirty. I met Adam the night before I headed out to Gardens of Eagan for my first day of farm work and we began dating while I was working on the farm. He was in graduate school at the U of MN for Public Health, but grew up doing plumbing and heating work with his dad. He had a plethora of jobs in and after college: handyman, plumber, barista, bookmobile driver, bike mechanic, sound technician, canvasser, among others. He would come out to the farm to visit and we were both blown away at seeing a really productive, successful organic vegetable farm in action. We went to Baja, Mexico and Southern California that winter to work on and visit some farms, and that spring Adam dropped out of Grad School to pursue farm jobs. We lived in Minneapolis and commuted out of the city to work on on some great vegetable farms like Riverbend, Gardens of Eagan, and Natural Harvest (now La Finca). The winter of 2004-2005 we went to Brasil and worked for 2 months on a biodynamic dairy, fruit, and vegetable farm. Tell us about your operation - how long has it been in existence and on what kind of scale? Has the business changed scale since its initial inception? We began Loon Organics in 2005 on 1.5 acres of rented land from Gardens of Eagan. We were very eager to farm but didn’t have the capital or knowledge to buy a farm and start out on our own. Martin and Atina set up an “incubator” situation for us, where we were able to rent organic farmland, rent space in their greenhouse and cooler, and we also rented housing on the farm from them. Our first year we just needed to get some experience ourselves growing and calling the shots, so we did a small local farmers market and sold a few crops wholesale to the Northfield Food Co-op and Valley Natural Foods in Burnsville. Both Adam and I continued to work at Gardens of Eagan part-time and had off-farm jobs. We were farming our plots on a very part-time basis but we got great experience and launched a small CSA in 2006, as well as got a spot at the first season of the brand-new Mill City Farmers Market in Minneapolis. We spent four years renting land at Gardens of Eagan and growing and maximizing our production on about 2 acres of land. From our first years at Gardens of Eagan, we also realized that we loved farming and wanted to continue on this path on our own farm one day. We found our current 40-acre farm in Hutchinson, MN (60 miles west of Minneapolis) in 2008 and moved here in the fall of 2008 with the goal of quitting our off-farm jobs and farming full-time for the 2009 season. We had 125 CSA shares in 2009 plus our farmers market booth and now were both farming full-time along with employing 3 full-time seasonal employees. A huge coincidence for us was that our Hutchinson farm was already certified organic and had been operating as a small CSA farm locally, so there was a good core group of people here to support us right away and we could start farming organically immediately (not waiting 3 years to transition conventional farm land). We plowed most of our fields on the new farm that first year in 2009 that Spring and tripled our CSA. It was a ballsy move in hindsight, but we didn’t really know any better. We had a pretty good year in spite of the huge learning curve of being on new land, managing employees and a larger CSA, and just barely kept ourselves from having to get off-farm jobs that winter. It’s been a constant building process since then, slowly adding, improving, and getting more efficient as the years go on. We now in our 11th season farming and the 7th season on this farm with a 200-member CSA, our spot at the Mill City Farmers Market, and some select wholesale to farm-to-table restaurants, food co-ops, and the Harvest for the Hungry program where we can donate extra produce to our local food shelves and get reimbursed for it. Can you tell us about the land you are farming on and your operating facilities? We are in the Prairie Pothole region of Minnesota, where the Big Woods ends and the Prairie Begins. We’re about a mile from the Crow River and this area was originally home to the Dakota people. Our farm was homesteaded in the 1860’s and from what we know from neighbors, operated as a traditional diversified farm in the same family for about a century. The 40-acre parcel that we own and farm was split off from the neighboring farmland due to a wetland in the back of the farm which prevented the new farm owners from farming ‘fencerow-to-fencerow’. That wetland saved this 40-acre parcel intact. The wetland and very low/poor drainage areas we do not farm and it provides us habitat for beneficial insects and animals, as well as beautifying and diversifying our farm site. There is a 100-year old dairy barn on site that we have converted and expanded for part of our packing and washing facilities. The original grainery has been re-modeled and supported, half is storage/garage area for our equipment and the other half is converted into housing for our seasonal employees with a summer kitchen for them. We added two tiny houses that Adam built for employee housing as well and have upgraded a shop for Adam to work in during winter and store equipment. There is a greenhouse for bedding plant starts and three unheated hoop houses (over 10,000 sq. ft) where we grow spring and fall greens, and summer tomatoes and peppers, and we successfully grew spinach all last winter. Our family lives in the original farm-house, also over 100-years old on the farm site. Like most old farm houses and farm buildings, everything is a work in progress but the improvements we’ve made over the past seven years are starting to feel noticeable and tangible now. We are around 60 miles west of Minneapolis. How many people work or volunteer on the farm? We have a great team that help us run this farm. This season we have had 2-3 full-time employees living and working on the farm: our farm manager, Lars Hermanson, his wife Liz was here for two months before she started a teaching job in Alaska, and Bree Lloyd. Then we have 3-4 part-time people, Katharine, Jenny, Kelly, and Liza that work with us primarily on harvest and pack days, and many of those gals have been with us for a couple of years at least. A group of five women do work shares with us, working for four hours in exchange for their CSA box each week, and we get tons of weeding done and big harvests of onions, garlic, squash, etc. It’s like having a crop mob here every week. The work-shares have all been with us for several years now too. My mom, Jacquie Frerichs, helps us nearly full-time with child care for our 4-year old son, Eli, and that is a crucial part of our farm team and frees up Adam and I to be full-time farmers and managers. There are a lot of hands that do this work, and we are grateful for their help. Can you describe your approach to growing? Our mission is to nourish mind, body, and soil. We are a certified organic farm and aim to leave the soil in better condition than we found it through organic and responsible land stewardship. We grow the most flavorful, fresh, high-quality food that we can for ourselves and our eaters. We also strive to nourish innovation, curiosity, and a deep educational experience on the farm. While we are a production farm, we dedicate our time and energy educating our employees, as many of them aspire to be farmers or at least increase their knowledge, and we have a structured educational plan and bi-weekly farm talks that we put on with our friends, Nick and Joan Olson at Prairie Drifter Farm in Litchfield, MN. What are the biggest challenges you’ll face or are currently facing this year? We have a wonderful crew this year, but all of our full-time employees will be moving on to other endeavors at the end of our season. Finding and retaining quality employees that have previous farm experience and are passionate, committed, and hard-working is a constant challenge for a seasonal business such as ours. We are at the point in our business when we need quality, experienced people on our team that can take on responsibility and management. This work is detail-oriented, extremely diverse and dynamic, and needs to be done quickly and efficiently. It takes a number of years to develop those skills and the work certainly doesn’t appeal to everyone. We expanded our infrastructure (pack shed, cooler, delivery vehicle), improved our employee dwellings, and added a 3rd hoop house. That expansion plus making a commitment to pay our employees a decent hourly wage and raising our prices to support their wage increase, has helped our farm take it to the next level of operation this year. It has been exciting to see the quality and quantity of produce that we can put out with the right tools and people, I think it is our best growing season yet. Adam also converted his third tractor from gasoline powered to an electric engine running on electric batteries, thus making over half our tractor fleet quiet and oil-free. We hope to add a solar array in the next year or two to power the tractors completely from the sun and off-grid. People can buy produce from us through our CSA program and at our Mill City Farmers Market booth. This is the best way to support us as you are buying directly from us. We also sell select produce items through Harvest Moon Co-op in Long Lake, MN, and our produce is on the menu at several restaurants: Spoonriver, The Bachelor Farmer (specifically featured in their Sunday night dinners), 320 Northeast, and Zella’s in Hutchinson. We open spots to our CSA in early January, and folks can e-mail us to get a reminder when new spots become open to registration. I teach an Organic Gardening class for free through Community Ed. in Hutchinson every March or April. Both Adam and I will often do workshops and presentations at the local organic farming conferences throughout the winter months. Farmer and machinery geek, Adam Cullip has recently converted three tractors to run off solar electricity. Curiosity, intelligence, hard-work, a strong back, attention to detail, pragmatic idealism, and previous farm experience is a must. Our life is rich in many ways, from bountiful produce to a beautiful place to work and raise our family, however it’s not an easy way to make an income. Thriftiness is essential. Continuing to build and grow our farm team, including expanding organic, diversified agriculture in our local area! We have a wonderful community of like-minded, creative farmers out here and our vision is to transform this area into a vibrant, supportive place for more sustainable farmers to start up and join us here. The farmland here is amazingly fertile, we are close to the Twin Cities, and our local communities are more and more interested in what we are doing every year. We are interested in how we can make land more accessible and affordable to this next generation of farmers--we need them! On the production side, we will be exploring more four-season growing, extending our season into 10 months of the year to provide hoop house greens during the winter months. Last winter, we ate spinach from our unheated hoop house every month through the winter, and we’d love to expand and offer that to our CSA and farmers market folks. Joe and Iman are two incredible people I have had the pleasure of calling friends. Both teachers, this musician and yogi duo came together in 2013 to create - You Betcha Kimchi - a Minnesota twist on the Korean classic, adding farmers and small business owners to their list of accomplishments. You Betcha Kimchi currently operates out of the City Food Studio in South Minneapolis where you can stop by every Tuesday night from 5-8pm and Saturday morning from 9am-1pm. Committed to high quality and locally sourced products, Joe and Iman have been able to locally source all of the produce needed to make their delicious fermented creations, bonus points for that guys! We caught up with them on sunny afternoon during a fermenting session to learn more about the process, the operation and their future plans. This week, we're talking farm to tabletop, or rather farm to vase! Weather you want to shop small or shop local, Christine Hoffman of Foxglove Market & Studio has got you covered. Not only does Foxglove have a wide array of locally produced and vintage home goods, they also specialize in being one of the only dedicated local flower shops in the state. Did you know that most of those lovely bouquets you're bringing home are grown using a heavy mix of fertilizers, chemicals and preservatives? Add to that worker exposure, ship time, resources and packaging and you’ve got one loaded bunch of tulips. Read more about it in Christine's words here. We knew there had to be another way to have our flowers and not feel guilty smelling them too, thankfully that's where Foxglove comes in. Foxglove Market & Studio is open, Tuesday - Saturday 11am - 7pm or Sunday 11am - 4pm and is located at 792 Grand Avenue in St. Paul. Stay up to date on upcoming classes and events, stop by for seasonal flowers and decor and this holiday season. Think about buying a locally made wreath or centerpiece for your celebrations, wreaths are between $35-65 a piece. Interested in becoming a local flower producer yourself? Foxglove is accepting new growers for the 2015 season. Boom! Now let's hear what the lovely Christine had to say when we bombarded her with quyestions one sunny afternoon. Our future is going to be BRIGHT. We believe that whole-heartedly, especially after meeting young folks who are already taking huge strides to change the way our food system works. Like Haley, our favorite MN GreenCorps member and all around awesome human. Haley has been working with the Food Group, a local food bank, for the past year helping to establish an on-site microfarm that produces upwards of a 100lbs of fresh produce a week for their food bank members. On top of growing for the farm, she coordinates volunteers, leads tours and hosts learning days for the community in the garden. As if that weren't enough, she also works as a Fruits of the City Coordinator and an Edible Landscape Consultant, overseeing Giving Gardens (swooon!). As she wraps up her time with the Food Group, she'll also be embarking on a new adventure that we'll definitely be following along with on her blog. All in all, we can't really say enough good things about the work Haley is doing but we sure loved her to pieces and think you will too! Go Lady Power!!! As a Minnesota GreenCorps member serving with the Food Group can you tell us what various hats you wear? My main hat is Microfarm Coordinator, where I lead volunteer groups in harvest, educate visitors, and provide maintenance to keep the garden healthy. Another is Fruits of the City Coordinator, where I help match volunteer groups and orchards, organize a harvesting event, and bring the extra fruit to local food shelves. I’m also an Edible Landscape Consultant, making sure that the partner Giving Gardens we established this year are getting the education and support that they need to prosper. As of yesterday, my official AmeriCorps service has ended, and I gratefully have accepted a position with The Food Group working on these same projects through the end of the season. What are you growing? And what methods? On our “Microfarm” even though it is a smaller space, we are growing a wonderful variety of crops. We have a little bit of everything; lettuce, tomatoes, bush beans, sugar snap peas, tomatillos, strawberries, eggplant, okra, zucchini, cucumber, peppers, collards, kale, broccoli, swiss chard, kohlrabi, beets, carrots, onions, leeks, radishes... and a few pollinator-friendly flowers out front! We have a newly constructed hoop house where our trellised tomatoes and squat peppers are happily prospering in their raised beds and warm environment. So far, we have been averaging over 100lbs of produce per week, harvested and donated directly to our food bank across the parking lot. Our growing methods are “organic”, although we are not certified. This is only the second year the land has been cultivated, and the lawn is trying it’s best to return and the bunnies have definitely snacked on our vegetables this season. It has been a series of learning lessons in natural controls, perseverance, and patience. What are your favorite supply centers or resource shops? For a small production operation like ours, whenever possible we try to utilize second-hand or recycled materials, and re-purpose old equipment. This year we even were able to start many of our crops from donated seeds! However, that’s not always possible. My favorite place to buy transplants is from the Friend School Plant Sale, which only takes place once a year on the Minnesota State Fairgrounds. They have a huge variety of plants, many unique, and reasonable prices all from local growers. From fruit trees to seed potatoes, they have everything- but get there early because they sell out quickly. Johnny’s Selected Seeds is an employee owned company, and a great place to purchase seeds and tools from. Their products are easy to use and made with a farmer in mind, and they offer many heirloom varieties and even organic seeds. We purchased our beloved broad fork from them this year, and it has been a great device in cultivating the land without fossil fuels or disturbing soil microbes. What are your most trusted sources for growing and farming? I discover farming wisdom dispersed throughout my friends and community. Local urban farmers, such as the folks at Stone’s Throw Urban Farm and Alissa Jacobsen at Hidden Willow Farm, have been a great resource for any questions I may have. They have been around the vegetable production block a time or two and know what’s what. The University of Minnesota Extension has excellent garden advice, and a Master Gardener program to connect with local garden experts and enthusiasts. Another major source of knowledge comes from my personal research; I devour farming-related articles like juicy gossip. Field trips are always a great way to explore AND soon I will be leaving on a quest via WWOOF (Worldwide Opportunities on Organic Farms) to learn even more about small scale sustainable farming methods being used across the country. What is food justice and what motivates you at such a young age to care about it? During my studies as an undergraduate Environmental Studies student, I was searching for the most effective way to “Save the World”, like fellow optimistic youth. I eventually came to understand that food and agriculture are at the heart of many current world issues, including energy, poverty, politics, genetically modified organisms, food security, international trade, health care costs, climate change, and more. I became engrossed in discovering these connections, decided that the current American food system was inherently flawed, and pledged my vocation toward educating others on understanding these connections and alleviating its negative effects by promoting food justice and supporting sustainable agriculture. It didn’t happen in one day, but I slowly realized that the most worthwhile career for me works toward a vision where everyone in a community has equal access and availability of nutritious sustainably raised foods. It’s a simple vision, and the road is long and winding, but working with those who share my goal makes it enjoyable and achievable. 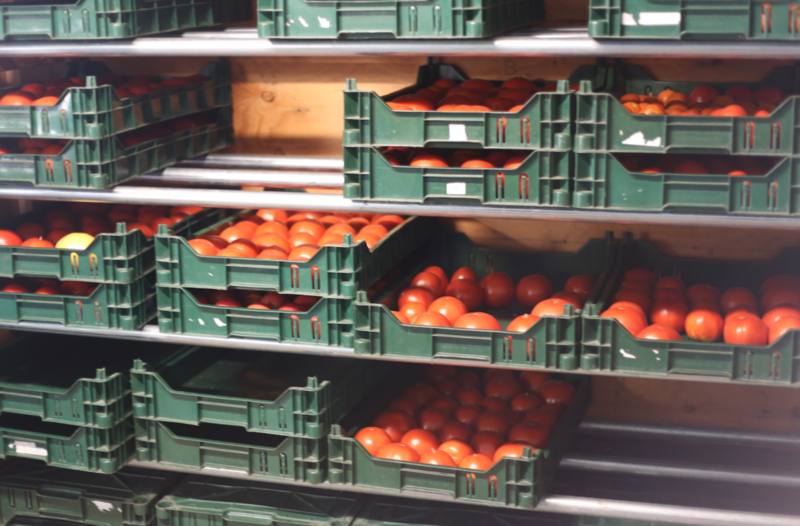 We think the biggest misconception is that food-shelves do not accept perishable donations, can you help us understand how fresh produce can enter into a food shelf and how do the Clients they serve access fresh produce? It can certainly be misleading to know that food shelves accept perishable donations when most food drives request “non-perishable” items, but actually the most requested items by food shelf clients are milk, meat, and fresh fruits and vegetables. These items are the most expensive for families and food shelves to purchase, but they are also integral to a well-balanced diet. This lack of access to fresh and healthy foods disproportionately affecting lower income populations is the basis for food justice, and the reason behind many recent fresh produce policies and healthy eating initiatives across the country. At The Food Group, more fresh produce than ever is flowing through our doors thanks to our innovative programming. In addition to the vegetables we grow in our front yard on the Microfarm, we also rescue surplus produce from the Minneapolis Farmer’s Market every Sunday, (sometimes gathering and donating up to 10,000lbs to local food shelves in one day) and our Fruits of the City program rescues fruit that would otherwise go to waste from backyard fruit trees and orchards, and shares them with those in need. Our Harvest For The Hungry programs partners with local businesses to purchase fresh vegetables from Minnesota and Western Wisconsin farmers, offering them a secondary market and providing families facing hunger with high quality local produce. Additionally, many home gardeners do not know that they are protected legally when donating fresh produce to food shelves by the Federal Bill Emerson Good Samaritan Food Donation Act which was signed into law by President Clinton in 1996. It encourages individuals to donate to non-profit organization for distribution for those in need, and protects you from liability when donating your veggies as long as “gross negligence” is not displayed (if you wouldn’t eat it, don’t share it). The message is, plant an extra row to drop off at your local food shelf! Clients seeking produce can find food shelf locations using the Hunger Solutions and Ample Harvest maps, and these resources are also helpful for growers looking to donate- simply call ahead to be sure they can accommodate your crop. What challenges have you faced in raising a hoop house this year in the burbs? We came across the standard obstacles you face when undergoing construction; making sure all components are “up to code” according to city ordinances, making meetings with the city inspector who’s notoriously late... being sent the wrong parts and waiting for a new shipment. Last November, when we had been optimistically planning to grow some late fall greens in the hoop house, we found out that we could not use concrete footings because it would classify as a “Permanent Structure” and had to dig 4ft deep holes in frozen soil to place long poles as footings instead. That was one of the worst days I’ve had on the farm. But it turned out to be worth it, because we are getting amazing tomato yields, and the hoop house has withstood over 70mph winds! A food bank is a non-profit organization that helps to provide nourishment to those facing hunger, but is different from a food shelf in that the items are not distributed onsite. Instead, the food bank purchases items in bulk for its food shelf partners, then delivers it to the smaller food shelf locations for distribution to clients. It’s similar to how banks store money, but people pull cash from an ATM. Food banks make an an impact on food insecurity and provide aid in several ways; a stronger purchasing power, meaning they can get more food for less money, they have larger capacity for storage, usually an entire warehouse with refrigeration units, and they have ample infrastructure for agency support and special programming. The Food Group in particular is a special because of its fresh produce programs, culturally equity programs, healthy donation policies, and nutritional outreach programs. How can growers big and small donate to a food bank? Home gardeners and community gardens are good candidates for donating to smaller local food shelves and pantries. It’s usually the perfect amount of intake for what is distributed during the week so that it won’t overload their facilities. For larger quantities from big growers, it’s better to donate to a food bank which has better storage capacity, operates on a larger scale, and can distribute equally among many smaller organizations so the produce reaches as many people as possible. If it’s donated for free rather than purchased, then it goes out for free, which means that some of the least accessible foods becomes more equally available to under-served populations. What are your sources of strength and nourishment? I find nourishment both physically and emotionally in growing food, and especially in cooking delicious vegetable-centric meals for loved ones. In times of stress, I bake endless goodies and share the treats with anyone closest to me, including strangers. I find joy in planting extra tomato plants in empty side-lots, reading Laura Ingalls Wilder books, dancing to The Big Chill Soundtrack, and playing banjo in the park while snacking on watermelon. I feel strongest when running fast, helping a friend, or during an adventure. Christina is the ultimate urban farmer. You can take our word for it because we lived next to her in North East Minneapolis for over two years. It was really incredible to witness permaculture practices in action within a small urban setting. Christina and her husband Pete are dedicated to carving out a permaculture like homestead within their entire front, side and backyard with total fearlessness. Every inch of space has a purpose or a plan to contribute to this total food system they are building in the name of self reliance, healthy soil and good food. Good food and watching things grow. How did you come up with your site design? We hired a local company (Ecological Gardens) right after we purchased the property. Our goals have changed a little since then and we’ve made some tweaks, but it’s starting to take shape. For example, we’re adding a passive solar greenhouse that isn’t on the plan to get us growing year round. What is your overall goal with your urban homestead? Primary goal is just to be more self sufficient. We’re a long way away from growing all our own produce, so my focus for the next couple years is to grow stuff we can either cellar, can or freeze, so that in the winter when local produce isn’t super available we aren’t having to get EVERYTHING from California or Mexico. Also, experimenting to see what works for us and what we like, so when we get there and are keeping track of a big production we kind of know what we’re doing. I also want to help close the loop on what we do grow, so we compost and use the chicken litter so we don’t have to rely entirely on buying fertilizer and soil amendments. The Frank Lloyd Wright of Chicken Coops. Built entirely by Christina and her husband Pete. This year's actually been pretty good for what we HAVE going. We had planned on planting a handful of trees earlier in the year, but it took until now get them. Our site plan has specific varieties recommended that aren’t necessarily what you’re going to find at your big box garden center and the supply just isn’t there right now. So, little change in plans there. The latest addition to the homestead is a home built mobile chicken coop that allows Christina to move her chickens around to pasture and manage pests, meanwhile the chickens get a snack and a little vacay from the main coop. Genius. What successes have you had or what are you the most proud of? The chickens are probably what I’m most proud of, although really they take care of themselves, so its ridiculous for me to take credit. But, a year and a half later, we have the same four-day-old chicks I brought home and they’re healthy and they crank out beautiful eggs. We also learned a lot building the coop and it’s easily the coolest house project we’ve taken on. This looks like a ton of hard work, why do it? Both of us had parents that had big gardens growing up, so for me it kind of never seemed like an option to NOT have some sort of garden/food production at home. And permaculture just seems to me like the “right” way to do it. We have four laying hens, all brought home as day-old chicks (from EggPlant) in March 2014. We have two Buff Orphingtons, one Silver Laced Wyandotte and one Ameraucana. The Buffs are easily the most friendly of the bunch. The Ameraucana was SUPPOSED to lay me charming little blue shelled eggs, but we’ve never gotten a single blue egg. I always planned on naming them, but as it turns out they’re kinda dumb. Never really gave me much personality to go off of for naming. What lessons have you learned since starting your backyard chicken flock? Mostly that chickens are crazy easy, and even though I grew up with chickens I psyched myself out once or twice. The first time one of my hens went broody I was on my way out of town for a long weekend with friends and couldn’t figure out what was going on. She came with me. My friend happened to be towing a trailer that weekend and we stuck her in a dog kennel and took her to Wisconsin with us. I’ve unclenched a bit since then. We mostly let them have free range of the yard now during the day, and are better at recognizing when something is actually up. What quality do you think it takes to be a farmer? Can you break down how your household sources food during peak growing season? Peak season maybe 50/50 home and CSA. I try and grow a lot of stuff for preserving so that we don’t have an overload in the summer, because of course when we’re at peak, so is the CSA. I LOVE our CSA (Harmony Valley), but in a couple years I’d like to be getting 75% of our produce from the yard, and then the CSA probably won’t make sense and we’ll supplement from the food coop. Hopefully, the greenhouse and continued focus on soil building will get us in that range. Who’s stronger boys or girls? I mean, I think 'yonce had it right! We run this mother! We met up with Libby London on her dye farm – Born and Dyed in Minnesota – to talk about her operation, the farm and her thoughts on an expanding beyond the food movement. Libby runs her business out of a farm in Ham Lake, MN called the Sandbox Center for Regenerative Entrepreneurship that she co-founded. We recently sat down with Jim Watkins, co-owner of Sociable Cider Werks, upon the businesses' one year anniversary to discuss small batch ciders, the challenges of year-round local produce sourcing in Minnesota, environmentally-friendly business practices and why juice concentrate diminishes the quality of a great hard cider. Over the last year, Sociable has become one of the major players in the seemingly ever-expanding NE Minneapolis brewing district. Sociable makes three flagship ciders that are available year-round (Freewheeler, Hop-a-Wheelie and Spoke Wrench), as well as one-off infusions and barrel aged creations. Their delicious products can be found throughout the Twin Cities at local watering holes and restaurants, as well as on draft in their own taproom. Look for Sociable Cider in cans at Twin City liquor stores in 2015! What is the main goal of your operation? We make great small batch ciders for the local craft beer community. We believe that hard ciders should be more than lightly alcoholic, made-from concentrate, sticky sweet apple juice boxes that currently dominate the market. We adamantly believe that fresh tasting ciders come from fresh-pressed apples, not concentrates. We just celebrated our one-year anniversary over Thanksgiving week! It's been an absolute whirlwind of a year. We went from a two person operation to a ten person operation in the blink of an eye. We started with just our taproom, then added bar and restaurant draft accounts, and are on the cusp of firing up our brand new canning machine, which means Sociable Cider is weeks away from being available on liquor store shelves! The business started in a garage, and we continue to do it because we love it! I was born in Burnsville and Wade is from Rushford, MN. Wade grew up on a family farm growing corn and soybeans. I grew up on a horse farm where we leased to people who wanted to board their horses there. Wade and I met at Carleton College in Northfield, MN. After college, we were roommates and moved out to New York City and both worked for investment banks. I worked for Citibank and Wade worked for Piper Jaffray. We both hated it and wanted to move back home. We decided we were both pretty over wearing ties. We talked a lot about starting our own business and had no idea what we wanted it to be. Once we found ourselves back in Minneapolis we started home brewing. We picked up cider from Wade’s father-in law who had been making it for twenty plus years with pressed apples. So we started making our own, tweaking it and developing it. Was Wade’s father-in-law pretty integral to the first few home brews? Yeah, he gave us a lot of tips and provided us with a ton of great old literature, cider-making books and ample feedback. After the initial batches, Wade and I started experimenting with adding in bittering components, including sorghum and hops. Were the addition of hops to your products primarily because of the bitterness aspect that you wanted to achieve? Yeah. Great ciders have three major flavor components – sweet, tart and bitter. The key to a really well balanced cider is obtaining that bitterness. There’s no real commercial infrastructure for bitter apples that are used in brewing in the U.S. During Prohibition there was no reason for U.S. growers to continue growing bitter apples, so they began disappearing since they aren’t good for anything except producing cider. In the industry they’re called spitters because you want to spit them out as soon as you take a bite since they’re so bitter. We’re working with Pepin Heights Orchard to develop a 40-acre plot of bitter apples that we’ll be able to blend into all of our batches. But, for the most part we’re trying to figure out how to achieve that bitterness in our products without shipping bitter apples in from the East or West coasts. For us, we really liked the idea of continuing to source locally and developing partnerships with growers who can grow bitter apples in Minnesota. In the homebrewing community apple graffs are really popular, where you blend apples and beer wort and ferment them together. We started home brewing graffs and had a lot of fun doing it. It really allows for a lot of flexibility. Hard at work brewing cider. Tell us about your operations and business model. Cider lives in a world between beer and wine. Our process has a lot in common with wine making, but the way people drink ciders has a lot in common with beer making. As a result, craft cider gets a full gamut of producers that fall all along that wine/beer continuum. While (or maybe because) both Wade and I grew up on farms, we built our business around a model that more closely focuses on brewing rather than growing. That said, we source our ingredients from the best growers/farmers/packers/malters in the area including our apple partners, Pepin Heights Orchard in Lake City, MN and our malt partners the Brewers Supply Group in Kasota, MN. What type of brewing is this and what do you focus on? We forsake using apple juice concentrate as a base for our products and instead use only fresh pressed apples to make quality dry ciders for the local craft beer crowd. If you like Angry Orchard, Crispin, Smith and Forge or Zima then chances are, our style of cider may not blow your hair back. On the flip side, if you enjoy drinking a wide range of craft beers and love that sour beers and lambics are just hitting the scene in Minneapolis, then we are the guys for you! Ciders made from concentrate are not particularly artful. Traditionally, high-end cider makers have been apple growers first. Cider brewing is much more like a wine making process - the flavor is largely dependent on when you pick the fruit, which is going to impact the acidity, and how you age it. The whole process is very similar to wine making just with a focus on the tree and its fruit as opposed to the vine. The flip side is that we treat the process more like a craft brewing process. You’ll be hard pressed (no pun intended) to find craft brewers who also grow their own grain because it’s difficult to be a brewer and a grain farmer. So in terms of our process, the focus is on using apples that are grown by experts to make the best possible craft made product. We source all Midwestern apples. Are you able to source apples for your products from the Midwest year-round? It’s tough to do that, so we run a very seasonal business – inventory build followed by inventory burn is our style. We experimented with putting some apples in cold storage last year with middle of the road success, so we’re still working on ironing that out. The big thing is that we’re lacking the necessary infrastructure in the Midwest to pack apples year round. Out West, the infrastructure is excellent. You can get a fresh Washington apple twelve months out of the year. The reason for that is because there’s a tremendous amount of infrastructure in place for picking and storing apples there the same way that Idaho has infrastructure for potatoes. That infrastructure doesn’t really exist here because the Minnesota apple consumer doesn’t demand local apples twelve months out of the year, so as a result you can only get them for three to four months during the harvest season. The taproom on a sunny morning. Do you think the lack of infrastructure for year round apple growing and storage in Minnesota has more to do with supply and demand or the colder weather here? I think it’s all driven by demand. I think that if people demanded Minnesota produce year round, then we’d be able to source Minnesota-grown apples for our products year-round. It also has a lot to do with the weather, but there are places that have equally unfavorable winter weather that still have farmers markets operating year round. A majority of Minnesota’s farmers markets don’t operate year round even though the technology for fruit storage exists. And, because Minnesota has never been a major producer of fruit, we’ve always relied on shipping it in from the West Coast. The more sustainable thing to do would be to build the fruit storage infrastructure here so that we can support farmers and a harvest that will carry us through the seasons. Michigan has this infrastructure in place a little bit and Washington State certainly has it as well. Around 80 percent of the United States’ apple production occurs within three counties in Washington State. The cost impact and environmental impact of shipping apples from across the country doesn’t make sense, but for a long time it has been a lot easier because of the infrastructure. We have a great apple breeding program at the University of Minnesota where they do a lot of cross-pollination to come up with new sweet, tart, marketable apples and then those get rolled out to the small farmers around the state. But, we still don’t have the infrastructure in place to become a large apple producing state. How did you hook up with your local apple producer, Pepin Heights? We found out about Pepin Heights after having conversations with some people from the University of Minnesota. Pepin funds a lot of the University’s apple breeding research. Utilizing our equipment all year when access to locally grown apples has such a tight picking and pressing window. What have you been the most proud of during your initial year? Our bourbon barrel aged Freewheeler. We are in the process of scaling up our barrel aging program. This was our first shot at it, and boy did it turn out well! Your tag line is “Decidedly different, delightfully sociable”. How is Sociable Cider Werks decidedly different? There’s literally nobody in the country that does what we do. Our products don’t focus on residual sugars; instead we focus on robust flavor profiles. Cider companies that use juice concentrate tend to produce products containing very little nuanced flavors. Do you consider your business to be environmentally conscious? One of the real decisions we had to make was whether or not to press our own apples, but we also wanted to be near people. The environmental impact of shipping apples cross-country is huge, which is why we stick to sourcing them locally. One of the reasons we work with Pepin Heights is because they do our apple pressing so we don’t have the cost and environmental impact of shipping the added weight of full apples. The spent apple pulp left over from pressing goes to feeding Lake City livestock. We’re also planning on packaging our products in cans because urban recycling centers are driven by aluminum costs. It costs more for them to pick up cardboard and glass than they make back, whereas aluminum values are high enough that recycling them actually generates revenues for urban recycling programs. We’ve gotten some flack for not offering customers glass growlers, which I think are highly disposable. Usually, people get three to four fills out of them before they break or are discarded. Instead, we offer stainless steel, reusable growlers. They’re a little bit more expensive up front, but they look great and are infinitely reusable. They can also be used as water bottles (when you’re not using them for cider!). We’re also in the process of switching over from having rotating food trucks outside the brewery to only using one resident food truck (The Curious Goat) that sources all of its food products locally and provides customers with only compostable consumables (i.e. plates, napkins, utensils, etc.). In the brewery, upwards of 95% of all the waste we generate is compostable. This past summer at our block party we also partnered with Eureka Recycling to host a zero waste event. Finally, we’ve been kicking around the idea of switching our glycol chilling system to an open-air reservoir system that would pump glycol outside in the winter to rooftop reservoirs to be naturally cooled as opposed to using energy to run a compressor. We’ve also talked about putting solar panels on the roof, but we don’t own the building, so we’re a little hesitant to put money into that. Cider flight stare down. Front and center is Freewheeler, Sociable's signature cider that tastes like an apple Champagne. What qualities do you think it takes to be a brewer focused on local sourcing and production? An unwavering commitment to quality. The juice concentrate option is so cheap, and easy from a sourcing perspective; I can see how so many people are tempted by it. We have to be pretty hard headed to stay true to the real thing even when sourcing our fruit comes with so many more challenges. Come to the taproom to enjoy our wares, and of course ask for them when you are out and about! We have a waiting list for our ciders at bars and restaurants because our fans have been so vehement about asking for us by name. To grow this category of craft cider, we have to ask that it be grown. Otherwise it is way too easy for a bar to just go with whatever low end macro stuff their distributor is slinging. We sat down with Stefan Meyer, Production Manager & Founding Farmer of Growing Lots Urban Farm, on their main urban farm plot and CSA pick-up location, located in the Seward Neighborhood of South Minneapolis. Currently in their 5th year, Growing Lots serves 60 full share CSA members in the community and provides a community hub for members to pick up fresh local veggies, interact with the people who grew them and connect with a farm - right in the city! We first met Stefan in the cold winter months when he taught a Growing Under Cover course through PRI. Since then, the space has transformed into a thriving farm lot. Here's what Stefan had to share with us about their operation!